While the mood of much of the U.S. was darkened by to the government shutdown, one light shone bright. The average price of gas in the United States fell $.19 in September. This was the biggest price decrease since October of last year when the average price fell $.26. 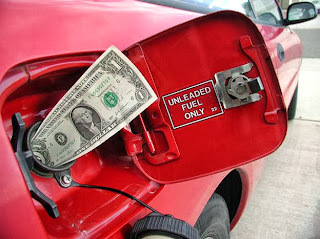 AAA recently stated that it is possible gas prices could decrease $.25 to $.30 by the end of December. Gas prices have been consistently above $3.20 since October of 2012, so it will be a rare sight to see them below $3.20. It has been speculated that the decrease in gas prices is merely due to the summer season ending because people stop traveling and vacationing, but others claim that it is directly related to the recent government shutdown. President Obama lifted the debt ceiling on the morning of Thursday, October 17, after an agreement was passed by the House of Representatives and the Senate. AAA predicted that the commodity and equity markets would lower if Congress didn't lift the debt ceiling, similar to these gas prices. It appears to be a trend that gas prices decrease when markets are lowered, as was witnessed during the economic recession that occurred in 2008. Gas prices averaged $4.12 in August of 2008, but sharply decreased to $1.70 by December of 2008. With gas prices being surprisingly low, US citizens are hoping to avoid price increases in the near future. Higher gas prices are generally caused by commodities traders. The commodities futures market allows traders to bid up the price of gasoline, which directly affects the delivery of gas at agreed-upon prices. Supply and demand affects the market as shown by increases and decreases of future contracts. If a commodities trader thinks that gas prices will be high, they will often increase the contracts they are signing, which directly affects the market and causes gas prices to rise even more. High gas prices can also be the result of high crude oil prices. Approximately 72% of the price of gasoline directly accounts for oil. The rest of the costs are due to taxes, refining, and distribution. These costs are fairly consistent and are required for gas to be distributed to the general public. Increases in gas prices have a direct correlation on companies' supply chains because it increases their overall costs and can cause financial hardship. Companies that require gas to function cannot do anything to change the gas prices, so they are forced to reflect the change in their cost in their prices and deliverables. It is important to remember that markets continuously fluctuate and this will have an impact on your supply chain. The good facet of this is that you can be assured that prices will not remain drastically high forever. While gas prices are low now, this is a fleeting scenario and they will inevitably rise again in the future. For now, we should take advantage of these low gas prices and instead hope that our government will work towards becoming more functional and agreeable.